However, your sidebar is an excellent way to display extra information and an even better way to display page-relevant details that don’t really fit into the “content” area of that page. Better still, using targeted content in your sidebar that is relevant to the page will make sure the user pays attention to it. And attention is certainly a good thing. In this article, I’ll cover common sidebar features and uses, what to avoid when it comes to sidebars, and different ways to get the most out of their use. Most blogs have either one or two sidebars, which appear on every page (or most pages) of the blog. Those sidebars are meant to provide your readers with extra information about your site and a number of widgets are available with a vanilla WordPress installation. As you begin installing plugins, some may add additional widgets, which you can then use in the sidebar. Several features are typical for the WordPress sidebar. Most bloggers today, whether they are running their blog as an extension of their business or as a personal blog, use their sidebar to include their most popular posts, email signup form, social media profiles, their most valuable products, and in some cases, affiliate banners and ads. In essence, your sidebar or sidebars are an essential part of your blog. They are like a blank canvas giving you infinite opportunities so it’s quite easy to get things wrong. Unfortunately, a lot of people treat their sidebar as a place to put all the random information that they don’t want to put anywhere else (or don’t know where to put it but feel it’s important). This is the wrong approach as every inch of your website is valuable, and none of it should be wasted. A poorly-structured sidebar will, at best, not add anything to your blog – and at worst, it will discourage visitors from sticking around. One of the biggest mistakes many bloggers make is adding every widget under the sun. That includes a headshot, bio, social media follow buttons, at least one or two opt-in incentives, links to their paid products and services, social media widgets, blogging awards, ads, categories, recent posts, popular posts, and more. Your sidebar is, however, definitely a case where less is more. Even though WordPress has lots of built-in widgets, and there are plenty of plugins that add even more, it’s a good idea to stick to just a few crucial ones and leave out those tag clouds and calendars. Keep it a focused space that will truly benefit you and your business. How to fix it: It’s easy for “widget creep” to happen over time. Review your sidebar every few months and ask yourself whether you can ditch any of the widgets. More often than not, you’ll find you can. Another common mistake is a cluttered sidebar. Even if you don’t have too many widgets in place consider the spacing between the widgets. If there isn’t enough space your sidebar will appear too busy and that alone might be reason enough to drive visitors away. How to fix it: Consider putting a thin border between each item as well as section headings to break up the clutter. Out of the box, WordPress comes with certain default widgets such as the “Meta” widget. Not only does leaving this widget in place make you look amateurish, it also offers no benefit to your readers. 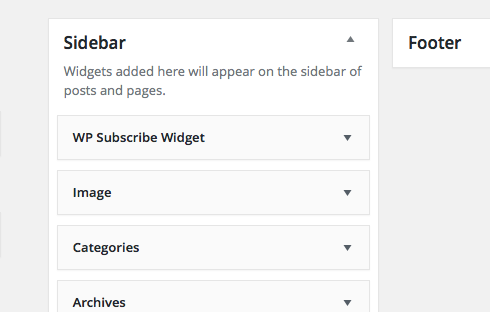 A look at the default WordPress widgets. Another widget that is enabled by default is “Recent Comments.” Leaving this widget on leaves you open to the risk of showing spammy or abusive comments that manage to sneak past moderation and spam filters. Likewise, the “Recent Posts” widget is redundant because your blog page already lists all your recent posts. How to fix it: Remove any of the default widgets that you don’t want as soon as you’ve set up a new blog. It only takes a couple of minutes to drag them out into the “Inactive widgets” section or delete them entirely. It might not seem like it makes a big difference at first, but think of how you go through blogs yourself. If you are like most readers, you’re probably most engaged at the very top and by the end, you’re skimming through and scrolling to the comments section. Make sure that the things you want people to see are closer to the top of the sidebar–such as your email option widget–while things like categories, popular posts, and your search bar are closer to the bottom. How to fix it: Take a look at other blogs in your niche and see how their sidebars are arranged then use them as a guide for your own sidebar. If you’ve been blogging for a while, you know the importance of an email list. Reaching out to people via email and being able to get more personal with them can make all the difference in your website’s success. How to fix it: Most popular email list service providers like AWeber and MailChimp offer visual editors for creating signup forms which generate the code you can then embed into your website. That same code can be placed into a text widget for your sidebar. If you’d rather not deal with code, there are plugins like MailChimp for WordPress which only require your username and API key. Some bloggers like to use various ad networks like Google Ads or affiliate links to promote products they really love. And while there’s nothing wrong with that, filling up your sidebar with nothing but ads or affiliate banners really detracts from the overall user experience. How to fix it: A better option is to group a couple of ads or banners together into one widget which offers a cleaner and more cohesive look. Getting your blog post featured on a big blogger network is great as it offers more exposure to your content. In your initial excitement, it can be tempting to add the network’s button to your sidebar so that everyone knows about your success, but before doing so consider if that button really adds any value to your readers? In most cases, they’re not going to see anything that they can’t see on your blog anyway, and the only thing you will achieve is to provide them with an opportunity to click away from your site. Your aim should be to keep readers on your site, not to encourage them to click away, right? How to fix it: Consider creating a smaller visually appealing image for the post in question and linking it directly to the post. You can still share your success, but clicking the image will keep people on your site and take them directly to the post rather than sending them off-site. As great and generous as it may seem to link to fellow bloggers whose content you enjoy, taking up half your sidebar with a long list of other blogs isn’t doing you any favors. Not only are you giving your readers multiple ways to navigate away from your site, reciprocal or link for a link strategies are just bad SEO these days. How to fix it: Create a separate page like Resources Worth Reading which includes your favorite bloggers and put it in your navigation bar rather than cluttering up your sidebar. Now that we got the biggest mistakes out of the way, let’s see how we can maximize all that sidebar space. There are two things to keep in mind if you want to create an effective sidebar. Before doing anything with your sidebar, take a step back and re-examine the goals you have for your website and your business. This may include increasing the number of your email subscribers, selling more of your products, getting more people to join your online course, or simply getting more clients to hire you. After you are clear on your goals, consider including one item in your sidebar for each goal. This might lead to too many calls to action in one spot, which in turn might overwhelm your readers. In that case, you need to set priorities and settle for the one call to action that brings the most value to you. Ideally, your sidebar should have no more than 5 widgets which support your overall blog and business strategy. Minimizing the number of widgets and focusing on the most important ones will keep your readers focused while allowing you to support all your major goals. Now that you know what you want to include in your sidebar, you need to think about the order. A good option is to include your photo and quick bio at the very top. This allows your readers to put the face behind the name and make your brand appear more human. After that, arrange widgets based on your goals. If the most important goal is to get more people to opt-in to your email list then your email sign up form should be right below your bio widget. Now, let’s take a look at the top widgets to include in your sidebar. Your profile widget should be one of the first things on your sidebar. Whether you are a business owner or a personal blogger, your identity is everything. It adds a human touch to your brand which is the quickest way to gain trust. Creating a mini bio is as easy as adding a text widget to your sidebar with a few sentences about yourself and a profile photo then linking to your About page. If you don’t feel like writing the HTML code for an image then a plugin like Black Studio TinyMCE Widget can help you spice it up and add additional formatting. I’m pretty sure you know by now the importance of an email list. That’s why including your best opt-in incentive is a crucial item in your sidebar. Whatever your incentive is, making it highly visible in the sidebar is a guaranteed way to increase the number of your subscribers. While there a few bloggers out there who are in favor of removing social media links from your sidebar there is no denying that social media is essential in growing your following and getting your content seen. Making sure your social media links are easy to find is important. Usually, when people land on a new blog and decide they want to follow you, your sidebar is one of the first places they look. You might be wondering what’s the difference. Aren’t they the same thing? When it comes to popular posts, there is a myriad of plugins that will display a dynamically generated list of posts sorted by the number of comments or visits. A plugin like WordPress Popular Posts can easily showcase your most popular content. However, you have no control over them and in some cases, your most popular post may not be the best. Recommended Posts, on the other hand, is a list of posts that you can manually select and showcase in your sidebar. This option gives you more control over which content is displayed, letting you showcase the posts that will resonate with your target audience the most. Finally, if you really want to get the most out of your sidebar, consider using different widgets on different pages and posts of your website. There are quite a few plugins that help you achieve this. Custom Sidebars is a deceptively simple plugin that gives you the power to completely customize the widgetized areas of your site. For example, your About page doesn’t really need your bio widget and with the help of the Custom Sidebars plugin, you can easily “hide” that widget from your About page. With Custom Sidebars, you can easily control your sidebars from Appearance > Widgets in the backend of your site without having to mess around with complicated settings. Create unlimited sidebars, clone content, change their visibility, import, export, customize by author or user type, dynamically replace any sidebar… you can it, Custom Sidebars can do it. Since your sidebar is an integral part of your blog, making sure it doesn’t slow down your website’s speed is crucial. Minimizing the number of widgets you have in your sidebar is the first step you should take. Finally, if you are using images in your sidebar, make sure the images are properly sized and optimized for the web so they don’t slow down loading time. To capitalize on the SEO potential of your sidebar, make sure your widgets aren’t using conflicting headline tags. H1 and H2 tags should be reserved for your site and post title respectively so avoid using them in the sidebar widgets. Another way to use your sidebar to boost your SEO is to link to other pages and posts on your own website. Internal linking is important as it gives more context to the current page. So why not make the most of it by linking to your most relevant posts? Of course, if you want an easy solution to optimize and improve your overall site’s overall performance, Hummingbird can zip through your site and find new ways to make it load faster. It’s a simple plugin to set up and include file compression, minification, and browser caching. The sidebar is overlooked by many bloggers but the way you structure it can have a big impact on the way visitors use your site and the actions they take once they’re there. It can be a great way to introduce you to your readers, lead them deeper into your site, and grow your email list. By following our tips, you will be sure to create a highly effective sidebar that compliments your blog and business goals. How is your sidebar looking? What widgets did you include and which ones did you leave out? Or perhaps you ditched the sidebar completely? Join the conversation in the comments below.